"I always ask myself a million questions." 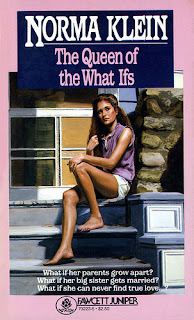 That's the first line of Norma Klein's book "The Queen of the What Ifs." I read this book when I was in the 6th or 7th grade and for some reason, it has stayed with me. And last night at around midnight - I thought of this book. Well, not so much the book but the title. Another night of insomnia and playing the "What If" game. It's not fun. 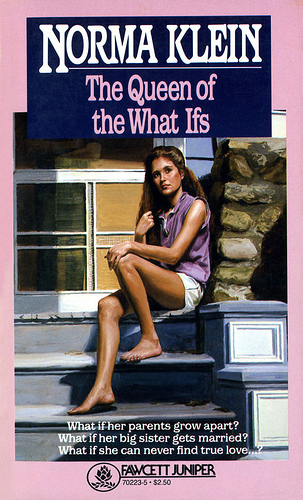 Because if I'm going to be plagued with "what if" questions, I would prefer to be sitting on the steps of my summer home, barefoot, skinny and young enough to be wearing short shorts and just running my fingers through me hair watching the sun set. Instead, it's 2 am and I'm in my jammies, sitting on my sofa in my 2 bedroom apartment, with my lap top reading blog posts and updating my Facebook status because I have a million questions keeping me up. What if The Boy hates his new school? What if the new teacher(s) can't manage The Boy's behavior? What if they ask him to leave? What if the 'typical' kids make fun of him? What if he doesn't have the proper amount of support? What if I'm pushing him too much? What if he's not ready to navigate a community school? What if I'm making the wrong decision? I would have thought that a public school acceptance for The Boy would have provided me with a good night's sleep. I haven't had one, in well...about a year. I'm tired. I guess I'll sleep by September or October. What "What If" questions keep you up at night? Labels: books I read growing up, faith, insomnia, lack of sleep, motherhood, stress of parenting, what if? Yup, "what if the typical kids make fun of them" keeps me up at night. One of my daughters definitely gets the whole social hierarchy that exists...and she's an alpha female. The other one? Not so much. To her, everyone is her best friend. She's desperate to have friends sleep over and no one invites her to birthday parties. I worry that she's a lonely outcast. She has bad days when she comes home and tells me that no one played with her in the school yard, it rips my heart out. "What if they're not getting enough support?" - they're in inclusion with a a set of twin boys who, while high functioning, require more oversight from their shared para. 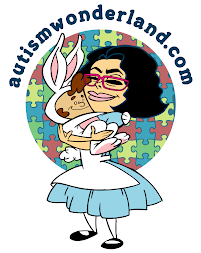 I worry that my girls get ignored BECAUSE they're able to function independently. My biggest one? "What if they get thrown out of inclusion too soon?" They're doing so well that I worry about someone wanting to make their school's numbers look good, and my kids will suffer. Our zoned school is not prepared to deal with my kids, and I worry about what would be next. We can't afford private school (and they wouldn't get any support from private school anyway). I try not to think about such things.